It's pretty official that Taylor Swift has reached SUPERNOVA star status. Since the release of 1989, there really is no stopping her Between the incredible album, amazing videos with beautiful men, being the unofficial mayor of New York City and now, joining Kim Kardashian in the realm of video games — Swift is doing IT. And, naturally since she is reaching the outer upper echelons of the celebrity world, the friends and family in her inner circle are going to be thrown even more in the spotlight, as fans rabidly eat up anything Swift related. 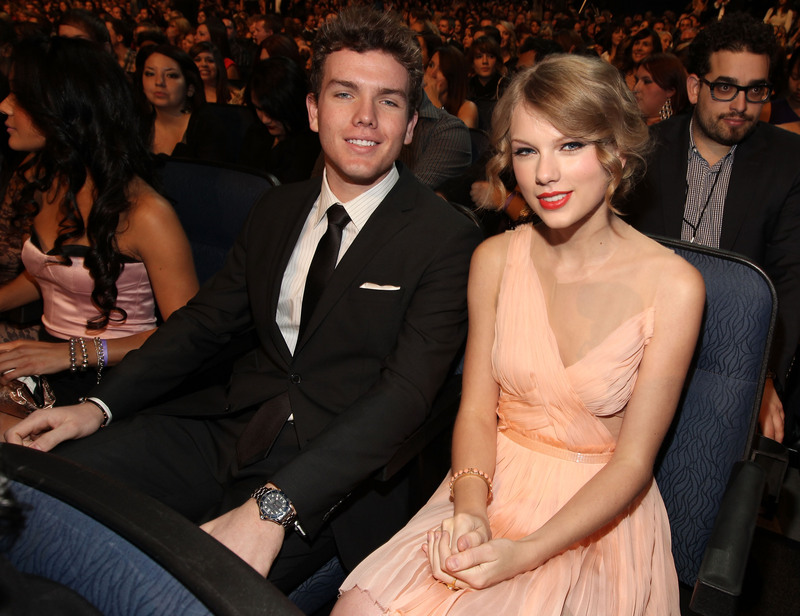 One specific member of Swift's circle who has always gotten a little extra attention is Austin Swift, her younger brother — and with good reason. He is like, really, really cute. Unless you are a Swift super-fan you might have never known how often her brother hangs out with her, but Taylor makes sure to include her little brother in all the perks of being a sibling of a major celebrity. You know, like sitting front row at awards shows, hanging out with Ina Garten, and spending the Fourth of July with a bunch of hot actresses. So when you're a hot, younger brother of one of the biggest celebs in the country, the public will start to want more and perhaps nothing is more important than the question: Is Austin Swift single? Do I have a chance at being Taylor Swift's sister-in-law and hanging out with her and baking cookies and being adorable? Let's see! Well, I consider myself a very adept sleuth on the Internet and can pretty much Google my way through any sort of mystery (and crawl out of the deep holes of Wikipedia), but let me tell you, tidbits of info on Austin Swift are few and far between. Based on what I found, we know that Austin is 22 years old, is a freelance photographer for Getty Images, transferred to Vanderbilt University as junior last year, but seems to now be at Notre Dame University, according to his Twitter account. I don't think I need to say that this is PROBABLY not 100 percent true, but it's kinda lame that this is the only conversation on the subject, and I don't want to think that a Swift would use girls "past the limit." I mean, what does that even mean? I don't think big sister Tay would approve of that, you've all seen what happens to womanizers in the "Blank Space" video. It was reported on Nov. 10 that Taylor skipped an appearance at the MTV EMA's in Glasgow this year, choosing instead to support Austin as he starred in Luigi Pirandello's classic play 6 Characters in Search of an Author at Notre Dame. News of her on campus quickly started to spread, but once again, there apparently really wasn't any mention of Austin. Oh, the struggles on being related to a global superstar! Come on, girls, get on your game! Are there "Swift-chasers" on campus at Notre Dame? I wouldn't doubt it. Besides the fact that he's cute, tall, and Taylor's little bro, Austin seems like quite the catch. Judging by his Twitter, he's quite funny, hangs out with cute cats, and listens to Kelly Clarkson — all big points in my book. Well, I can deduce that Austin Swift is probably single — there isn't any evidence to the contrary, at least — and like most every senior in college, he is preparing for life after college. And when Taylor is your sister, that will be anything from ordinary. Maybe he'll move to NYC and pursue his photography and acting dreams? At any rate, it's likely that he will be single and ready to mingle. Life is about to be even better for Austin Swift.